New Exhibit! 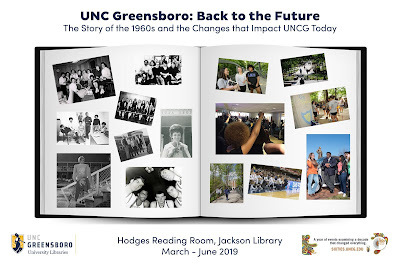 : "UNC Greensboro Back to the Future: The Story of the 1960s"
On March 14, 2019, more than thirty people stopped by Hodges Reading Room for an open house event to celebrate our new student-curated exhibit "UNC Greensboro Back to the Future: The Story of the 1960s." Student curators provided visitors with personalized tours of the exhibit and provided reflections on their experiences researching campus history. This exhibit was curated by graduate student Erin Blackledge with assistant from undergraduate students Alexis Castorena and Malory Cedeno. Sarah Colonna, Associate Faculty Chair for Grogan College, and Erin Lawrimore, University Archivist and Associate Professor, served as grant coordinators and faculty advisors for the exhibit. Student curator stipends were funded through a grant from the UNC Greensboro Interdisciplinary Collaboration Committee. 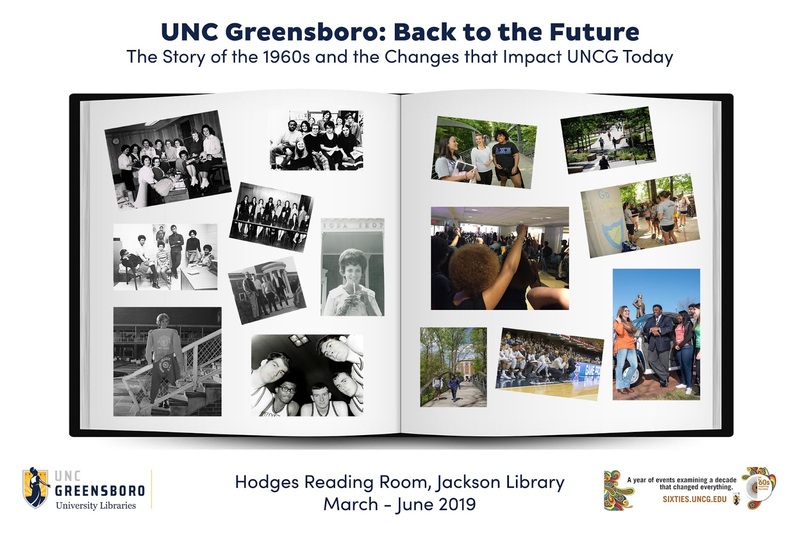 "UNC Greensboro Back to the Future" is available for viewing in Hodges Reading Room through June 2019. Hodges Reading Room is on the second floor of Jackson Library. The exhibit is open Monday through Friday between 9am and 5pm. By combining reflections and poems from current undergraduate students from Grogan Residential College with primary sources from the 1960s, "UNC Greensboro Back to the Future" explores the enormous social changes that arose during this momentous decade and demonstrates how UNCG students today reflect on its past. Topics explored include campus desegregation, civil rights movements, and the transformation from Woman's College to UNCG. This exhibit is part of UNC Greensboro's year-long celebration "The '60s: Exploring the Limits." You can learn more about the campus's upcoming events and activities to examine and understand this decade at sixties.uncg.edu. If you have not had a chance to get by the Nancy Drew exhibit in the Jackson Library Lobby – please do so! Perhaps more than any other book series, the Nancy Drew mysteries have captured the hearts and imagination of generations of young adults. First published in the 1930s, the books featured the adventures of the independent, plucky daughter of widowed attorney Carson Drew. With her best pals Beth Marvin and George Fayne in tow, Nancy Drew constantly finds herself in the middle of thrilling mysteries which were inevitably solved by the last chapter. The first three books were published in April 1930 and The Secret of the Old Clock, The Hidden Staircase, and The Mystery of Lilac Inn were immediate successes. By the seventh installment, Ned Nickerson is introduced as Nancy’s love interest, often tagging along on her adventures. Originally penned by Mildred Benson under the pseudonym of Carolyn Keene, later volumes were ghostwritten by various other authors, keeping a relatively consistent style. Through the many decades of publication, Nancy and her friends saw numerous updates. In the first books, Nancy sported pearls and pumps and drove a “roadster.” By the 2000s, her look was modernized and she drove a hybrid electric car and handily used her cell phone for quick calls and information queries. These updates have been reflected not only in the style of the characters, but also the framework of the books. In 2003, publishers Simon & Schuster concluded the format of the original series and featured her character in the new series, Girl Detective. By 2013, the publishers again changed the format of the books into The Dairies, further updating the character and her adventures. The enduring worldwide appeal of Nancy Drew has been a result of engaging plot-lines and characters, as well as the successful marketing of the brand through the decades. Lunch boxes, cookbooks, games, and paper dolls have kept the characters active and relevant. This exhibit reflects the popularity of the Nancy Drew franchise by incorporating books and artifacts from the Martha Blakeney Hodges Special Collections and University Archives! After a very successful launch event on April 14th at Little Brother Brewing in Downtown Greensboro, the Well Crafted NC project continues to grow. 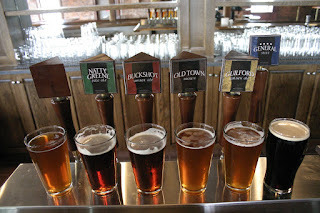 The project, which began in Fall 2017 thanks to a University Libraries Innovation and Enrichment Grant, will be expanding its documentation scope to cover the craft beer and brewing industry across North Carolina. Between 2010 and 2017, North Carolina saw the number of independent craft breweries in the state skyrocket by 445% (from 45 in 2010 to 245 in 2017). In 2016, the craft beer industry had a $2.042 billion impact on the economy (ranked 10th in the country). During this new phase of growth, Well Crafted NC will focus on collecting more oral history interviews with brewers and brewery owners in our state. The project will also continue collecting and digitizing historical records from North Carolina breweries. Additionally, one the project leaders - University Archivist Erin Lawrimore - recently received a Faculty First Summer Scholarship Support Award from UNC Greensboro's Office of Research and Engagement. This award will support a series of oral history interviews with women brewers and brewery owners in North Carolina. This project will ensure that the voices of the women in the industry are heard, that their stories are recorded in their own words, and that they are included as a vital piece of the history of beer and brewing in our state. The Well Crafted NC team has expanded the project's outreach and educational components as well. In addition to the launch event, Well Crafted NC did pop up exhibits at the Biere de Femme festival as well as at the Greensboro Chamber of Commerce's April Coffee and Conversation event. They will also be doing an exhibit on June 2nd at the Beer City Festival in Asheville. The project leaders recently were interviewed on the local podcast Gate City Chatter. 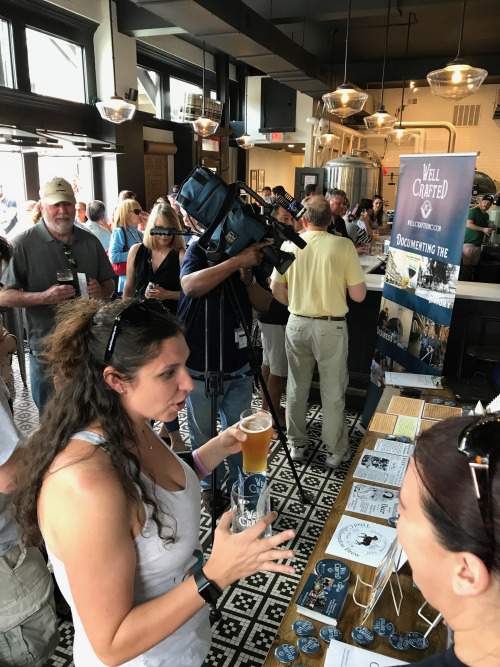 Fox 8 News also did a feature piece on the project and the history of beer and brewing in Downtown Greensboro. Other coverage includes a front-page article in the Greensboro News & Record as well as articles in Winston-Salem Monthly, Greensboro 1808, and Western North Carolina Woman magazine. Well Crafted NC is a project of the UNC Greensboro University Libraries. The project coordinators are Richard Cox (Digital Technology Consultant, ERIT), David Gwynn (Digital Projects Coordinator, ERIT), and Erin Lawrimore (University Archivist, SCUA). To keep informed about the new developments with the project, you can follow Well Crafted on Facebook, Twitter, or Instagram. To learn how you can support the growth of the Well Crafted NC project, please see www.wellcraftednc.com/support.